To celebrate the launch of Farm Essentials, a new insurance product for small farmers from NFU Mutual, we are showcasing small farmers at the top of their game. In the first in the series, we profile Will Steward’s Living Larder. 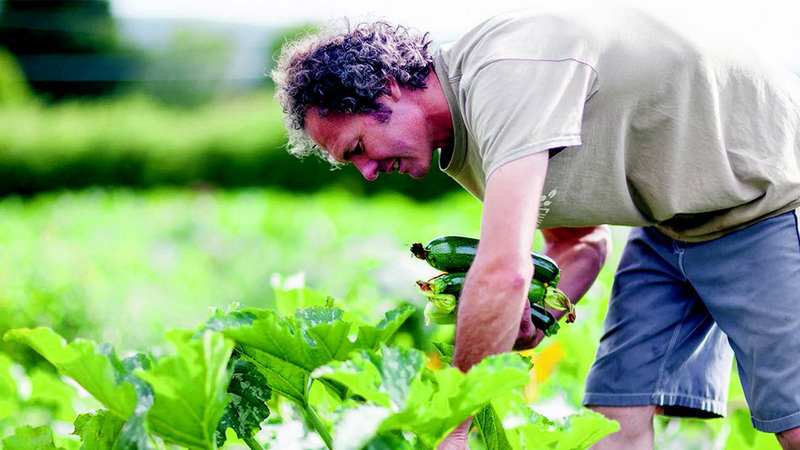 Will Steward refers to himself as a market gardener rather than a farmer or grower. Will Steward’s enterprise on the Isle of Wight may run across only 3.2 hectares (eight acres), but it sustains five full-time employees and has both wholesale and direct sales channels. He refers to himself as a market gardener rather than a farmer or grower, but his three-year-old business, Living Larder, has had to face many of the challenges of a large-scale horticultural business. Growing is in Will’s blood; his family first began its vegetable business on the island 100 years ago. Cheap imports flooding the market in the mid-1990s led his parents to give up, but after qualifying as a chartered engineer and moving to Bristol, Will felt drawn back to the land. He moved back to his parents’ Galley Horne site, near Apse Heath, with a vision consumers were more interested in buying locally and eating seasonally. He began by planting some outdoor cucumbers. They tasted so good that someone offered to buy them all. Today, Living Larder grows more than 50 varieties of vegetables all-year-round. Will explains Living Larder, which he runs with his wife Aimee, has a broad customer base, which means they are in the fortunate position where they can grow anything and know it will be used, either in their vegetable boxes or by chefs and local retailers they supply. “We deliver vegetable boxes once a week, 52 weeks a year, and it makes up nearly 50 per cent of our business.” Three delivery rounds cover the entire island and customers can choose from four different sized boxes. “I still do some of the deliveries, so I can speak to our customers and maintain quality. If you walk away too far, the quality might slip, but you would not know because you were not keeping an eye on it. “We have focused on the local market because they are the ones who are there every day. Tourists come and go and you cannot build a connection with them. Building a connection with consumers is something Will is passionate about. He says: “I am using about eight acres and altogether there are five members of staff – Aimee and I, a grower, assistant grower and a driver and packer who also works in-field. We can just about sustain five members of staff. Will enjoys inviting customers to the land so they can see what he has created and how it works. “I want people to come and say ‘they are good guys, I like the way they are giving people jobs and I want to support them’. Will believes this focus on honesty and the desire to create something worthwhile has appealed to consumers. This focus on relationships is also key when it comes to supplying restaurants. To foster this relationship, Will experiments with alternative produce which will appeal to chefs, who are always looking for something different to add to their menus. From five different types of aubergine to watermelon radishes, he is always prepared to try growing something new if it will keep his chefs happy. A make-do-and-mend attitude has ensured the business has not had to invest enormously in machinery, land or buildings. A natural advantage comes in the form of the Isle of Wight’s climate, which typically gives them a longer season. Will says: “The extra couple of weeks at the start and end can make a difference, so we try and play it to our advantage.